Chapel Allerton and Chapeltown are two areas of North Leeds both contained within the Ls7 postcode. They used to be the same place but over the years they have become distinct. Chapeltown has a stigma which Chapel Allerton wants to avoid. 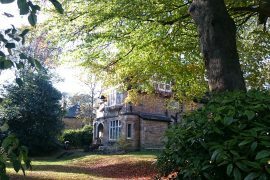 However Chapeltown has beautiful houses and a large park and more affordable rents. Chapeltown does not exist legally but it does in the residents hearts. The name Chapeltown is a shortened name for Chapel Allerton and described the area on the hill with clean air. Previously there was no separation of the two areas. Chapeltown Police station was in Chapel Allerton (now a restaurant), Chapel Allerton Hospital is in Chapeltown. The area now defined as Chapeltown is often delineated by being either side of the Chapeltown Road, (but that was the road that led to Chapeltown/Chapel Allerton) and Chapel Allerton is the area above Potternewton lane and Harehills Lane. 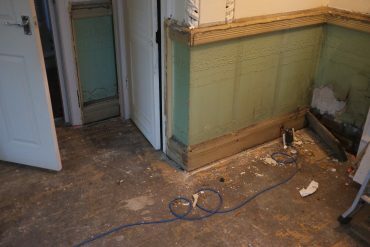 When our house was built in the 1880’s there were four main areas in North East Leeds. What is the perceived difference between Chapel Allerton and Chapeltown? If a loiner (person from Leeds) was asked to describe these two places this is what they would probably say. Chapel Allerton; an area of affluence, full of restaurants and bars, a bit up its self, a place where lawyers, accountants and Yummy Mummies live. Hipsters with coffee shops, fishmongers, semi detached housing , grocery shops, toy shops, yoga studios. The Knightsbridge of the North is how the estate agents used to market it. 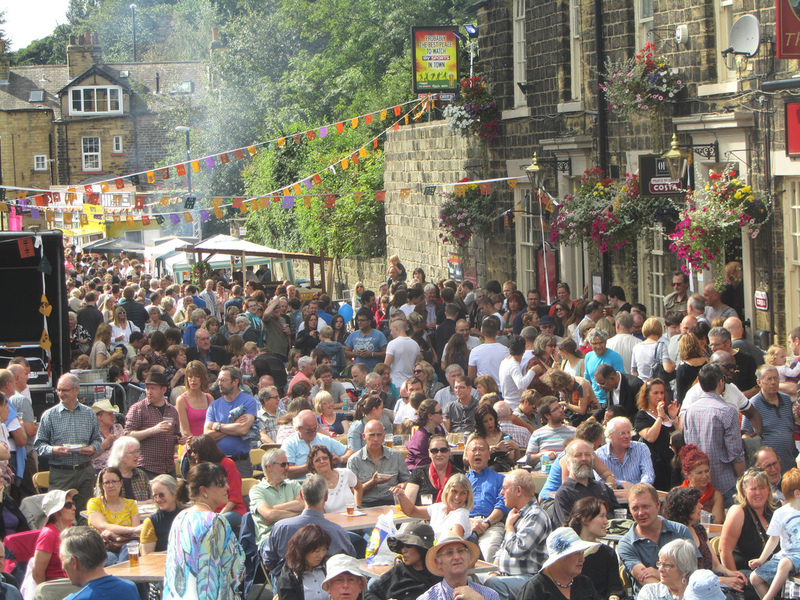 It was recently declared one of the best places to live in the North by Sunday Times Newspaper in 2014 and 2018. Chapeltown; an area of poverty, immigration, prostitution, guns, drugs and crime (a lot of that reputation dates back over thirty years to the 80’s and the riots and is a stigma on the area). It is also an area full of temples, churches, dancers, DJs, poets, artists, radicals, hippies, co-op’s, large parks, carnivals, beautiful Victorian and Georgian Villas and bohemians. Say Potternewton and people don’t really know where you are talking about. How did these areas become so different? There were only a few houses when this map was drawn (1858) but within 30 years there were tens of thousands of houses in the area of Chapel Allerton or Chapel Town. If you look on the map the top area is Chapel Allerton / Chapeltown and the lower area is Buslingthorpe and Potternewton. I haven’t been able to identify the exact decade when the bottom became known as Chapeltown and the top Chapel Allerton but by the 1960’s the areas had become distinct from each other and by the 1990’s divided from each other. This seems to have a lot to do with social change. The area now known as Chapeltown was developed first and has large Georgian terraces, very large Victorian Villas and semi detached villas. Later it was filled in with high quality large Victorian terrace houses until it was later completed with smaller Victorian terraces, there is very little Twentieth Century building in Chapeltown. 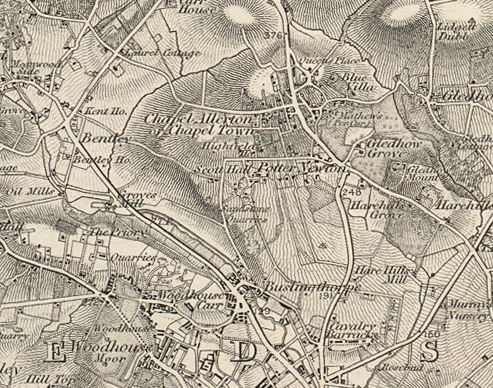 The South East of what is now called Chapeltown was called New Town, the South West was called Buslingthorpe and the North was called Potternewton. Chapel Allerton although older was a small village and was on the whole developed later as transport improved and people could live further away from their place of work. It comprises of smaller Victorian and Edwardian terraced housing, and larger 1920’s and 1930’s onwards semi-detached housing. We also love Chapeltown. There is not a chain shop in sight, the whole place is a thriving enterprise of local independents. As a child, my dad used to drive us over to Chapeltown to the Jewish Bakery to get fresh bread and bagels on a Sunday morning. Later it was for the carnival and Reggae festival. Then as I got older I would go to the Blues clubs, Roots (also known as Cosmo’s or The Pheonix) and the West Indian Centre. Now I go to shop at Continental stores for the dried pulses, fresh herbs, spices and hard to find ingredients (they also sell a lot of hair extensions). I highly recommend the Dutch Pot, A1 Beauty on Newton Parade (OMG £2 to get my eyebrows threaded without appointment). There is also the Chapeltown Arts festival (not as big as the Chapel Allerton Arts festival which is not as big as the Chapeltown carnival). The photo at the top of the page is one we took at the Chapeltown Carnival in 2012. There is also the Northern School of Contemporary Dance, Leeds Media Centre, East Street Arts Union 105 studios and Bauman Lyons Architects. Every shop in Chapeltown is independent, and it has benefited recently from a large heritage grant . Is Chapel Allerton on the march? Chapel Allerton has been on the move, getting bigger and bigger. When we first moved into the area in 2000, any houses below Chapel Allerton Primary School were not in “proper Chapel Allerton” they were in Potternewton. 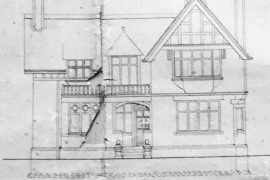 Since then houses have been developed at Mansion Gate on Harehills Lane and have always been described as being in Chapel Allerton. We have friends who live in the Roxholme’s who call it Chapel Allerton (see map at top). Chapeltown is shrinking, and Chapel Allerton is consuming it all. Most people would rather live in Chapel Allerton it seems. Workers flocked to Leeds in the Georgian period, first from the countryside but then as Leeds economic strength grew in the Textile trade both in tannery’s, fabric making, and of course tailoring (Burtons, Marks and Spencer) more people were required. To help keep the factories going Immigrants first from Ireland escaping the Great famine and then Eastern Europe escaping the Pograms in Russia (1880 onwards) fled to UK many on their way to find a better life in America. 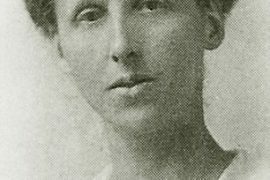 They were persuaded to come to Leeds (the Promised land delivered as the sign in Leeds train station used to announce) where they were put to work in sweatshops. Many of these people over the generations managed to work their way up and become wholesalers, finishers, tailors, property developers. As people made their fortune in the Victorian times and moved up through the property ladder they moved from sweatshops on the outskirts of town to the fresh air and new larger houses in Chapeltown. 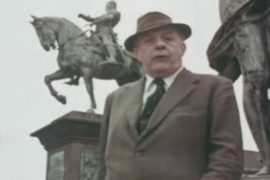 Lyrics of a song written by Tom Maguire, a poet, trade union activist and socialist, “on the occasion of the strike of Jewish tailors at Leeds”. It calls for united action to defeat the “sweaters” who employ immigrant labour for low wages in “sweating dens” (these would now be called sweatshops). 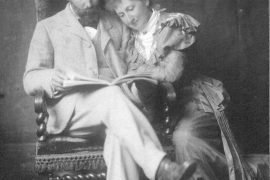 Maguire was born in Leeds, the son of Irish immigrants, and died of pneumonia at the young age of 29. This one penny songsheet was published in East London by the radical Yiddish language newspaper ‘Workers’ Friend’, and includes versions of the song in both English and Yiddish. By first World War many of the Jewish families had moved into the better houses of Chapeltown and the Synagogue was built. Following World War I, a national campaign was launched named ‘Homes for Heroes’, which sought to provide soldiers and their families with suitable housing. This push for council housing for those who required it developed into incorporating the rest of the population. The Housing Act of 1930 encouraged councils to clear slums within their boundaries, which had become hotspots for social deprivation. Slum housing largely consisted of Victorian terraced, including back-to-back, properties constructed as a result of mass urbanisation during the Industrial Revolution. The housing had deteriorated structurally, as well as not providing sufficient sanitary facilities. In many cases, whole families would share just one room. New semi detached housing sprang up. It was smaller with little gardens, indoor bathrooms, running hot water, a garage and drive for the new breed of car ownership, heating and easy maintenance. These were more modern and fashionable than the old fashioned, large, damp draughty large Victorian homes. In the meantime the war had led to a boom in the textile industry many of the uniforms or the cloth produced to make the uniforms were produced in Leeds. More and more people were needed to work in the booming textile industry. Immigrants from India were brought in. India was renowned for its beautiful textiles so to further help the textile trade Sikhs were encouraged to migrate to show their skill in textiles and move to leeds .The first Gudwara was in Chapeltown . After the second war we faced another labour shortage and this time we paid and encouraged people from the Caribbean to come and make their fortune, now collectively known as the Windrush Caribbean community, many moved into Chapeltown, where there were already Black ex-US servicemen who had decided to stay in the UK after the second world war . 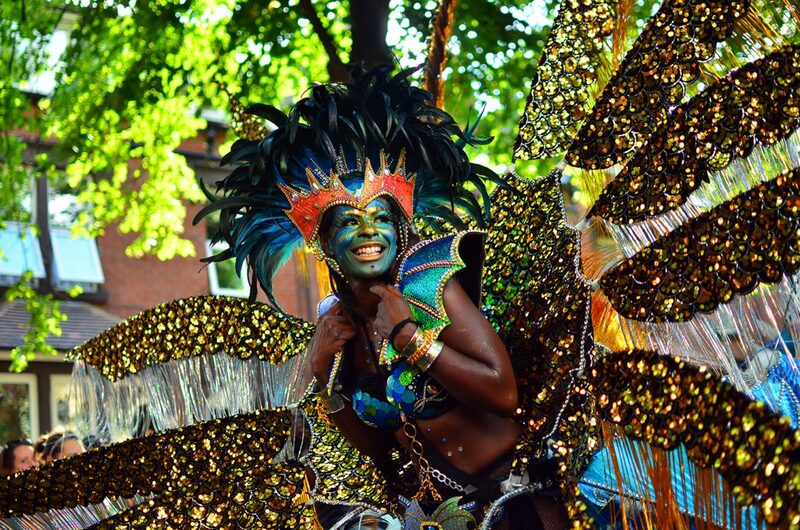 The Chapeltown carnival was begun in 1967 (now the Leeds Carnival) and is Europe’s oldest Caribbean Carnival. By now many of the Victorian terraces were being knocked down as part of the slum clearance and large modern tower blocks were being built in their place. Chapeltown avoided slum clearance in part due to the high quality nature of much of the buildings but the whole of Buslingthorpe was cleared away to create large Tower blocks and The Sheepscar interchange, this created a divide between Chapeltown and Leeds city centre. The Interchange was supposed to be key to future success of the city of Leeds, The Motorway city of the Seventies. The sheepscar interchange was visioned as a fast connection between York/Wetherby via the A58, Harrogate with the A64, Hull and Manchester with the M62 and of course the greatest of them all the M1 which joined Leeds to London. Obviously now it is just one big traffic jam and cuts us off from walking or cycling into the city. Many of the large houses in Chapeltown were turned into offices, doctors, veterinary surgeries, playgroups and nursing homes. The smaller houses were split into bedsits and small flats which offered cheap accommodation. Chapeltown was identified as one of the poorest areas in the country. The film Chapeltown: One year on shows the area at the height of its deprivation with high unemployment and poorly maintained houses. It also shows some glorious 1980’s fashion. There are no films that I can find about Chapel Allerton. There were several riots in Chapeltown in 1975, 1981 and 1987 . A: What you want is rare but Laurel Mount, off St Mary’s Road is very pretty and quiet. 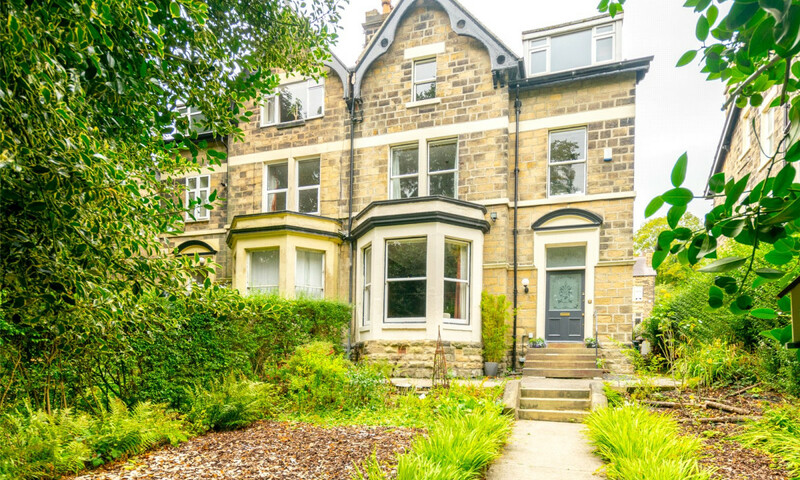 Near Chapel Allerton (top end of Chapletown) with beautiful stone buildings, (there were once tennis courts here) and this flat has large gardens to the front and rear. Lots of squirrels, birds, trees and you could probably walk to town. or this for a flat on Harrogate Road in the centre of Chapel Allerton. You’re a bit of a ponce who wants a yuppie style pad to suite your personality… Here it is! Fabulous character, stunning modern bathroom and the ‘Cherry Wood’ style kitchen is a simply divine. (We’re told this is an expensive German design but it certainly looks the part!) Good sized living room, master bedroom and the second bedroom fits a double bed for guests. No work needed, there’s off street parking and frankly if you make one less trip a month to the Hugo Boss shop, you’ll be able to afford this. Chapel Allerton has the shops, bars, restaurants and the wealth, Chapeltown has the beautiful old housing , and the large park. The people of Chapel Allerton love where they live they just wish they could buy a bit bigger house, maybe something with character, something to aspire to, why live in a small through terrace when you can live in a large semi detached villa with garden, or a beautiful flat with large bedrooms and bay windows BUT they are scared. 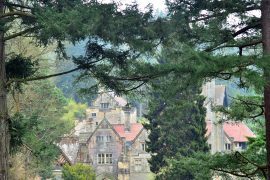 The houses are being snapped up and brought of disrepair by developers and people outside the area who are not aware of the history and difference. Historically and according to the Royal Mail it is Potternewton. According to the electoral ward it is Chapel Allerton. According to the conservation zone it is Chapeltown*. According to our deeds we are Newton Park. 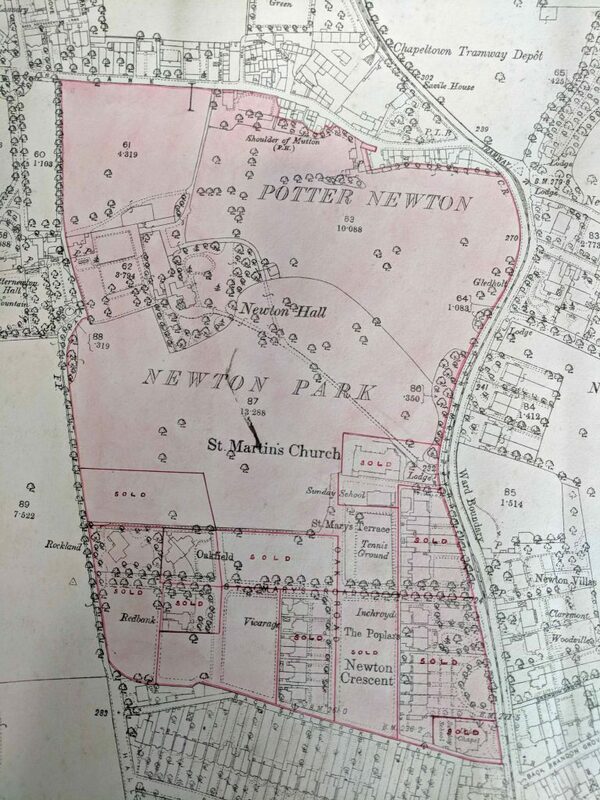 * I have since discovered, from the planning and conservation officer, that the conservation zone was named Newton Park, Potternewton. However, when they wanted to protect some buildings in Chapeltown, the easiest way to do this for paperwork was to extend an existing conservation zone, so for the sake of bureaucracy we we were moved and renamed. 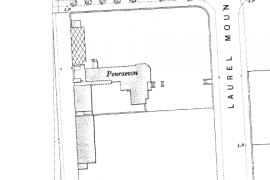 When we first went to see Penraevon it was described by the estate agent as being in Lower Chapel Allerton. Maybe we should say we live in Upper Chapeltown? or Lower Chapel Allerton? According to Rightmove maps of Chapel Allerton, Potternewton and Chapeltown we are in all three. The more I have got involved with the locality I can absolutely say it is Potternewton. BUT nobody has heard of Potternewton despite it being a very old area of Leeds. There is Potternewton Park , but that is in Chapeltown. There is Potternewton Lane, but that is in Chapel Allerton. Only two areas really exist Chapeltown and Chapel Allerton and we live in the bit in-between. We live on the old parkland grounds of Newton Hall of Potternewton. Newton Hall developed the Newton Hall Estate, this first consisted of the Newton Park Estate development but carried on in the 1920’3 and 30’s to create the St Martin’s and Riviera Gardens. Newton Hall no longer exists, but evidence still exists in street names Newton Terrace, Newton Villas, Newton Lodge Drive and the lodge gateposts are at the bottom of our road as is the lodge house. So where do others think we live? I asked the residents of Newton Park Estate on our residents facebook page. What do you call where you live? They had a choice of Potternewton, Chapeltown and Chapel Allerton. The winner was Chapel Allerton with 44% of the votes. This did seem to be mostly voted for by the younger residents. People who had lived in the area for a long time tended to call it Chapeltown. 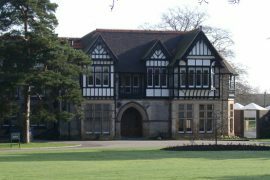 Newton Park , Off Chapeltown Road, in the Chapeltown conservation area, in the postal area of Potternewton in the ward of Chapel Allerton, LS7, North Leeds, Yorkshire. Goodness ! what a piece of work. Hope you get more readers to get the historic facts out. Why not publish as a leaflet / broadsheet ? And so part of Roundhay Ward. The corner shop sold more Guardian copies than for miles around..and we had a mental health hostel halfway down the road, local prostitution , elderly fungus hunters from Eastern Europe, lecturers, artists, musicians skilled artisans a BnB and an Asian womens’ centre all on the same block.